See more objects with the tag instruction, floral, scrolls, recording, lace, sample. See more objects with the color silver slategrey dimgrey or see all the colors for this object. This is a Chemical lace sample. It is dated ca. 1910 and we acquired it in 1971. Its medium is cardboard, linen and its technique is embroidered on dissolvable substrate, mounted on cardboard. It is a part of the Textiles department. This sample card is one in a series of cards produced by two retailers located in Springfield, Massachusetts. 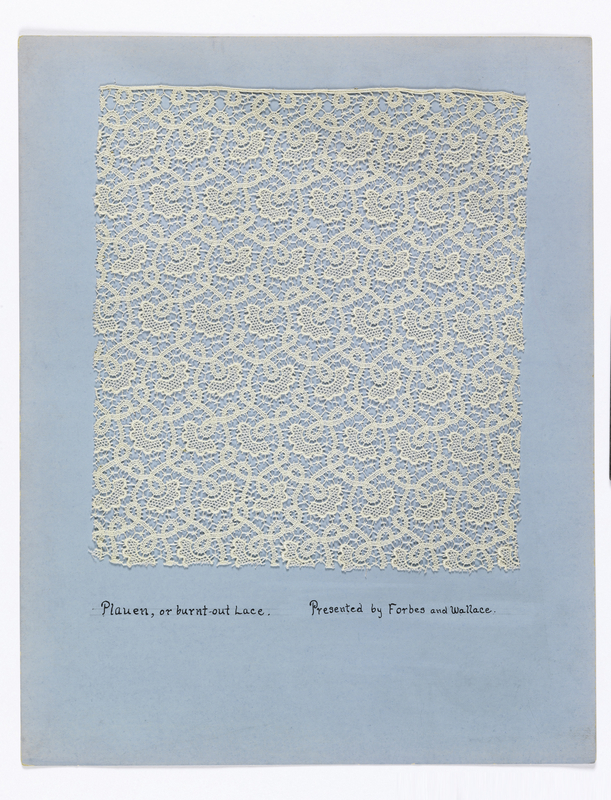 The card is mounted with a lace-like sample entitled "Plauen, or burnt-out Lace" from Forbes & Wallace, a well-known department store. Plauen refers to the town of Plauen, Germany, a locale known for the manufacture of machine-made lace, in particular, "burnout" or chemical lace. The lace produced using this process required an embroidery machine, often times the Schiffli machine, to produce an embroidered design on a cotton or net substrate. Afterwards, chemicals or caustic soda were applied to "burn away" the substrate leaving behind an open, lace-like fabric that could be used for curtain panels as well as other decorative and domestic purposes. 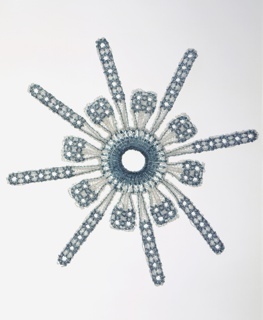 This object was donated by George Walter Vincent Smith Art Museum. It is credited Gift of The George Walter Vincent Smith Art Museum. Gift of Ellis Developments Ltd..
(Cards) 22" x 14" or 14" x 11"
Hand written on most of the cards, "Presented by Forbes and Wallce."